I think about this recent work like a love letter. Fresh Paint Magazine had the pleasure of visiting Nathan Pankratz in his Philadelphia studio, prior to the opening of his latest exhibition “So many ways to say I love you, I think I’ll try every one” at Bridgette Mayer Gallery. 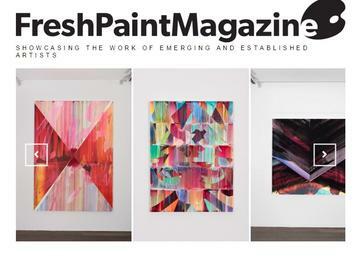 We were impressed by the richness of content behind his beautifully layered abstract works. Each piece takes into consideration the physicality, psychology and even economics of color. Nathan’s strong understanding of history and science bring together beauty and meaning. The following interview explores the artist’s process, inspiration and background in relation to his work. Nathan Pankratz received his B.F.A. from the Pennsylvania State University in State College, PA) in 2004 and his M.F.A. from the University of the Arts (Philadelphia, PA) in 2008. Pankratz was awarded the Henkels Award by the University of the Arts in 2008, and his work is prominently featured at the Fox School of Business at Temple University in Philadelphia, PA. He was a founder and member of the Philadelphia-based collective Tiger Strikes Asteroid from 2009-2011 and has exhibited widely, including several international shows along with previous solo exhibitions at the Patterson Gallery in University Park, PA and the Gallery @ 543 on the campus of URBN, Urban Outfitters headquarters in Philadelphia, PA among others. The artist currently lives and works in Philadelphia. FP: We are interested in your process. Can you give us a glimpse into how each piece comes to life? NP: As far as application goes, I use bigger brushes and work flat a lot of the time, so I can pour and have a very liquid atmosphere with the work, which allows for a lot of play with transparency. There is a lot of experimentation ahead of time. These surfaces are key to the works. I layer, ground and sand to create these ivory like finishes, so when you hit them with the brush you can pull the paint and it doesn’t give up on you. I am allowing the paint to be as liquid as possible and playing with movement. The canvas is stretched over panels to make sure the surface is completely flat. There are fun things that happen with the pigments where they pull apart because of the diluted binder. This is all important as I am playing between chaotic movements and slow pulls. FP: What medium do you use? NP: Acrylic. Some of pigments come from watercolor. There is graphite mixed in some of these works, as well. Everything is water based, because it needs to be able to dry. Usually, I get a couple hours of work time in each studio session. If it were oil, it would stay open for quite a long time. I have limited time to be in the studio now with having a family, so being able to come in, make my move, and plan for the next day is important. FP: The texture you achieve through this process is absolutely beautiful. NP: What happens to these, because of the paint laying so flat, it doesn’t pick up the weave of the canvas. That causes a separation of pigment, where it really visually replicates print. I find it fantastic to be able to achieve that finish with paint. The process ties in with what I’ve been working on with for this show. You can quantify color and understand it from a scientific method, but at the end of the day there is an experiential level to it. For example, when you see the color yellow the wave length is about 570-590 nanometer, but when you have red and green light combined you also see yellow but the nanometers don’t add up, so you can’t mathematically quantity why you are seeing yellow. Yellow is physical as light, but it’s also psychological. I think that’s why color has always been so poetic. We see in both in color and light and dark. There is massive art history war between line/design and color. The fact that we don’t quite understand color frees it up to be on the level of poetry. FP: It’s amazing to see these works in person because we can see the story and process in each painting. NP: It really is a story. An image is a one time thing, but how it is made unravels over time. In painting, that process is really beautiful because you can imagine the length of time it takes to create something. It is a joy that is unique to painting. FP: How do you feel your work has changed since your last exhibition at Bridgette Mayer Gallery? NP: Being able to change the mode of production is really important. It is difficult for me to see an artist who is playing the same note, even if it is really beautiful. The last show I was exercising lot of restraint. It was very colorful, but the color was buried underneath such darkness. This one will swing the other way and celebrate in a pure and optimistic sense. I am allowing the poetry, the purity of color, to be reveled in and talked about. FP: You mention you experiment a lot. Do you practice directly on canvas or do you keep a sketchbook? NP: I do a lot of drawing, but I found what actually works for me is photographing my work. I will document a brushstroke and then digitally manipulate it. Photoshop speaks the language of photography, but also painting when we talk about opacities and layering. These new tools create a wonderful way for me to research. Artists use what is available to them throughout history. The work can’t help but reflect that. With these works, there is a textural element built in. Masking is important because it creates a fast rupture between brushstrokes. Being able to use today’s tools is important to the work. This painting could not have been made 20 years ago, even though it is seemingly traditional. FP: How does your personal story play into your work? NP: I have a background in construction. I studied architecture before I switched to painting. I was always making things. I worked very hard at becoming good at drawing, but I was also very good at math. I was always hanging around the painting studio. I loved how seriously they talked about painting, and that eventually inspired me to switch. FP: How do you replenish your inspiration? NP: I photograph a lot. Finding new color combinations is always interesting. David Reed’s sketchbooks are really fascinating. He spent years studying color combinations. I have a pretty tight palate. For this whole show I work within a range, but from that range it exponentially increases. Because of the paint working while it’s wet, it’s always mixing and changing. It may start off as a cadmium but go in the direction of crimson, and that’s ok.